The emotions are riding high in light of what has happened in Newtown, CT. We all have a lot of opinions about a lot of different things. It seems the only thing that we aren’t divided on is our devastation over the loss of innocent lives. This is one of the most offensive things I have ever seen. And to be clear, I am a Christian. The argument that the absence an official school prayer time would indirectly (or directly) correlate with a slaughter in an elementary school is one of the most ridiculous things I’ve ever heard. And, again…I am a Christian. For the purposes of this post, I want to focus on “omnipresent”. Widely or constantly encountered; common or widespread: “the omnipresent threat of natural disasters”. As it relates to God, it means this is the attribute of God by which He fills the universe in all its parts and is present everywhere at once. Not a part, but the whole of God is present in every place. He who descended is the one who also ascended far above all the heavens, that he might fill all things. This is a small list, but the conclusion is that, in the simplest terms, there is no place to go where God is not already there. The point is this: If you believe God is omnipresent, then you believe God is everywhere. Not everywhere except public schools. He’s not the big bad wolf who is stopped by brick. Back to the t-shirt above. When I see that, I automatically think that whoever believes that doesn’t know the true character of God. 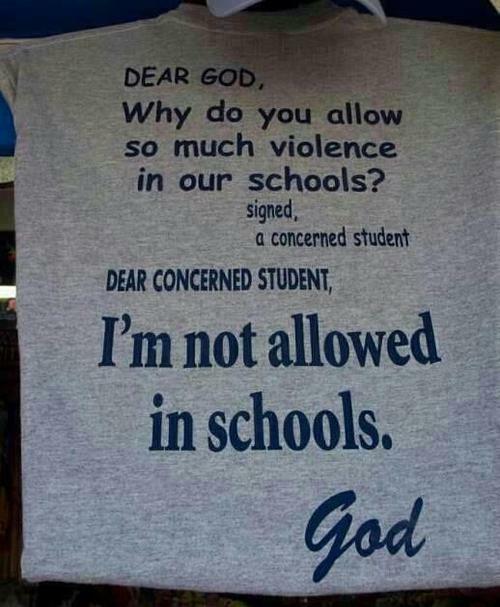 To say that God is not in schools is to believe that he is NOT omnipresent. I’m not trying to be judgmental, although I realize I probably sound that way –and maybe I actually am. But, I’m really trying to point out that when people know you are a Christian, they are watching and listening to what you do and say. And, when you say that God is being controlled by humans, it diminishes your witness. Finally, there are a lot of people who are sincerely asking the question that the t-shirt asks. Christian, is that the answer you really think that God would give to somebody who is hurting? At a funeral I attended recently the priest said something about suffering and how God did not promise us that there would be no suffering He promised that He would fill it with His presence. I can’t say it brought me comfort then or now, but it does makes sense with regard to your post. Your right He was at the school that day and He is with each of us in our sorrow.